One of my favorite recipes from Breaking the Vicious Cycle by Elaine Gottschall is the one for peanut butter brownies. I wanted to come up with a version that is more like a muffin or cupcake, and thus this recipe was born. It is very quick and easy and one of our favorite portable treats. Combine all ingredients except for the vinegar and mix well (this usually requires an electric mixer for me). Add the vinegar or lemon juice and mix well, then pour into either muffin cups or a greased muffin tin. I find this recipe makes 9 good-sized muffins, or 12 small ones. Bake for 25 minutes in a preheated 350 degree oven. They are done when an inserted toothpick some out clean. These are very light and moist with a texture very much like cake. If you use 1/2 cup honey they could easily be used as cupcakes at a birthday party. OOOO! I'm going to make these with added carob and cherries! I think I'll top them with a dollop of cashew cream. Maybe with real whipped cream. I'd better eat something because these recipes are making me obsess! I have sweets on the brain! Yes, that is some sort of reaction with the sunflower seeds- I've heard of it before! It's harmless but looks really weird. I think it may be the baking soda if you used that. The mashed banana is a really good idea. they tend to cook in less time in my oven ... like 15 minutes..
Just found your blog today and am very excited to try some of these recipes. I was wondering though, other than peanut butter or sunflower, what else could be used in recipes calling for "nut butter"? You can make nut butter out of nearly any kind of nut or seed. You may be familiar with tahini, as an example. Around here, we can also find cashew butter, macadamia butter, almond butter, hazelnut butter etc. at many stores. Tahini and almond butter are the most widely available of the "other" butters. Making nut/seed butter in a food processor is easy though, so if you have trouble finding what you want, or have specific requirements, then going that route might be your best option. I hope that helps. Enjoy the recipes, and let us know what you think! I have the hardest time with these. They always seem to burn on me before they are fully cooked. Last time I thought I had it, it wasn't burned, but it was overcooked. Also, they tend to deflate on me, but I think that is from the butter still being a little grainy. The part that DOES work out is absolutely delicious, though. Is there a certain nut butter that is fool proof? I want to try this, but I'm guessing store bought peanut butter wouldn't work. I'm thinking it has to be cashew or almond butter?? I made these, and the batter was incredibly dry. They baked into dry, crumbly, very dense balls -- didn't spread out to fill the cups at all. I did it exactly as written, but maybe should I have added water to think them to make them like muffin batter? They looked like balls of peanut butter when I put them in. I want to try again, just not sure how to go! It sounds like the nut butter you used was really dense and lacking in its natural oils. 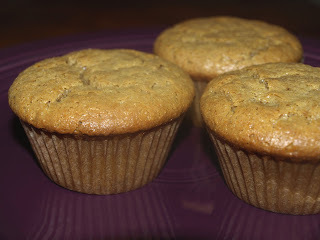 When I make these, the batter is very similar to regular muffins batter... It was like that even after adding eggs and honey??? Personally, I think water would be a bad idea here. If you aren't making your own nut butter, get one that has oil on the top, the kind that you really have to stir, and try that. Just a side note, I finally got these to cook mostly without burning, but I had to take the temp down to 275 and cook them for over 30 minutes. I haven't gotten the process exactly down, though. I think the cooking time is probably about 32 minutes altogether, but I need to make them again to be sure. Last time I cooked them for 25 minutes and they needed more time, so I put them back and forgot to set the timer, and within 5-10 minutes, they were cooked through with a burnt bottom. This time I cooked them for 28 solid minutes and left them in the oven (off) for another two minutes, and they weren't done. That said, the bottom was perfectly done, so I don't know if it is the temp distribution of my muffin tin (I think it's aluminum), my oven, or needing a lower temp still. Maybe I'll try 35 minutes at 250 next time. It could be that your nut butter was less oily than the one used for the recipe, or that your eggs were smaller. I have not made this recipe myself (it comes from my fellow blogger, Sierra), but I would bet that it could tolerate the addition of up to 1/4 cup fat (butter, ghee, coconut oil, etc.). I would start with two tablespoons of fat, melted, being added to the batter. I would also check the muffin's progress after 15 minutes in the oven, per previous comments. Love this recipe so much! They've worked great with peanut and almond butter. Today I had success with substituting a mashed banana for the honey, making them acceptable to my "no added sugar" partner. :) Thanks for the great and easy recipe!